WTO: A way out of the crisis? The World Trade Organization (WTO) is in a fundamental crisis. What role does the US play in this? The University of Bern’s World Trade Institute (WTI) is organizing a conference on the subject at the WTO in Geneva at the beginning of February. The World Trade Organization (WTO) law has regulated the international trade of goods, services and intellectual property between its members since 1995. The WTO offers a framework for negotiating trade agreements and a dispute settlement process. Dispute settlement between WTO members is the central pillar on which the multilateral trading system is built – it supports the stability of the world economy. The Appellate Body acts as a kind of commercial court and handles the disputes. Dispute settlement is considered to be successful by all 164 WTO members – with the recent exception of the US: This has plunged the WTO into a serious, existential crisis. The current US administration's criticism of the WTO is not a completely new phenomenon: The dispute settlement and, in particular, Appellate Body have already been criticized under former presidents. Recently, the US has blocked the appointment of judges to the Appellate Body. This is possible because the appeal proceedings have to be decided unanimously by judges from all WTO members and each member thus has a right of veto. In the meantime, only three instead of the contractually stipulated seven members of the Appellate Body are still in office. “By not filling the positions of the Appellate Body’s retiring members, the existence of the entire WTO system is in jeopardy,” says Michael Hahn, Director of the Institute of European and International Economic Law and Director at the University of Bern’s World Trade Institute (WTI). Will the Appellate Body no longer be functional soon? The situation is getting worse: At the end of 2019, the Appellate Body will consist of just one judge, as no successors can be appointed for the members of the Appellate Body who have resigned until then due to the US’ veto. “This means that the Appellate Body will no longer function, as all cases have to be decided by three judges. If this actually happens, the dispute settlement system loses its pacifying role because if a state loses in the first instance, it can appeal in the knowledge that the appeal instance does not currently exist. However, the notice of appeal prevents the first instance’s report from becoming legally binding,” Hahn continues. “The WTO crisis is also an expression of the failed attempt by the US and many other states to integrate China into the World Trade Organization’s rule-based system,” says Hahn. China represents serious competition for the US in the battle for economic, geopolitical and military supremacy. Many Chinese products are subsidized by the state and produced by state-owned enterprises. One point of contention between the US and the Appellate Body, for example, is that the Appellate Body sees the term state enterprise more narrowly than the US does. The US includes all enterprises under this term that are owned or controlled by the state, whereas the Appellate Body only includes enterprises performing state functions. For this reason, the Appellate Body did not regard Chinese steel companies as state-owned enterprises, which caused much surprise in Western countries given the party and state's control over all areas of life. Other WTO members also see potential for improvement in the dispute settlement system: For example, the EU, together with WTO members, put forward reform proposals to address the concerns expressed by the US on the one hand and to preserve the overall highly successful system on the other at the end of 2018. “With these proposals, the EU has returned the ball into the US’ court so they can get involved in the negotiations and the current problems can be solved,” says Hahn. But the US rejected the proposals without explaining how a way out of the crisis could be found. The overwhelming majority of WTO members adhere to the rule-based dispute settlement and see it as a key element of the rule-based multilateral trading system: This system is based on defined rules and not on political power. • Whether WTO dispute settlement has made a useful contribution to the rule of law and the development of international law. The conference will be attended by WTO members’ heads of delegations, legal experts and academics from Switzerland and abroad. “We hope that we can make a small contribution to objectifying the current debate and perhaps even to finding solutions,” explains Hahn. That's why we organized the conference as soon as possible. It will be the start to a series of events dealing with the WTO issue. “The WTO warmly welcomes this conference and the WTI's involvement in this important discussion. But we should also not overlook the fact that this topic particularly affects us as a small country with a high export ratio in the heart of Europe,” concludes Hahn. The University of Bern’s World Trade Institute is an interdisciplinary center that conducts research on international trade and investment issues as well as sustainability. In addition, it offers teaching and training on topics related to economic globalization. Prof. Michael Hahn became the Managing Director of the Institute for European and International Economic Law of the University of Bern Law School in 2015; he also is a Director at the World Trade Institute. 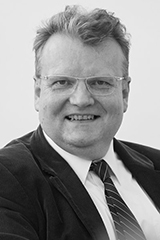 Before joining Bern University, Michael held the chair of European law at the University of Lausanne and was a Professor of Law at the University of Waikato, Hamilton (New Zealand); he remains affiliated with both institutions. Lisa Fankhauser is an editor at the Communication and Marketing Office of the University of Bern.